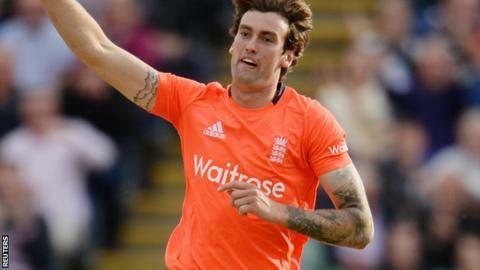 Reece Topley says his decision to leave Essex and join Hampshire is "a career move to try and better myself". The left-arm seamer, 21, named in the England one-day and T20 squads to play Pakistan in November, joins Hampshire on a two-year contract next season. He made his T20 and ODI England debuts in the recent series against Australia. "It's a move to try to better myself and get the most out of the ability I've been given and the talent I've got," Topley told BBC Radio Solent. Topley, who took 20 wickets in eight One-Day Cup matches for Essex this season, will meet up with his new county later this week before relocating to the area over the winter. "I can't wait to get started with a side I've looked admirably on for quite a while now," he said. "I enjoy playing at the Ageas Bowl, it's a nice place to play cricket with the wicket there and it's just a great place with a good set up and I can't wait to get started with the boys." Topley leaves Essex, a county he represented since the age of eight, and is hoping to force himself into contention for England's Test squad. "Obviously, Test cricket is the ultimate goal and hopefully I'll achieve that," he added. "But, I know I'm still quite a long way off and still have a lot to work on in my game. I think Hampshire's the right club to develop me for that."